Through this crazy season the Ravens have always been able to count on their defense to show up on Sundays. Since their week 1 let down against the Broncos, the Ravens defense has only given up 16.9 points per game. Early in the season the defense was led by a menacing pass rush, but now are headed by a strong secondary. This unit has always kept their struggling offense in games that they had no business being in. They have been one of the stingiest red zone defenses in the league. There is only one problem, though, and that is their inability to come up with big plays in the fourth quarter. It has been a theme for this defense for the season and it has cost them a chance to win a couple games. That is not to say that they deserve the blame for losing those games because the offense typically didn’t score in the first half, but it is to say that when given the opportunity to give their offense one last chance to tie or win the game, they were incapable of coming up with a stop. In each of their last four losses, the Ravens’ defense has been unable to stop their opponent on late fourth quarter drives and allow their offense one more chance to score. It started against Green Bay when they couldn’t slow down Eddie Lacy, who ran all over the defense in the fourth quarter and kept the clock running. A week later in Pittsburgh, the defense was met with the same problem, as the Steelers were able to run out the last two minutes of the game and kick the game winning field goal as time expired. Then, after their bye week, the Ravens were losing to the Browns and had two chances to get the ball back for their offense, but instead, the Browns converted two first downs and kicked another field goal. The offense was left with an impossible situation of trying to score a touchdown with 14 seconds left. 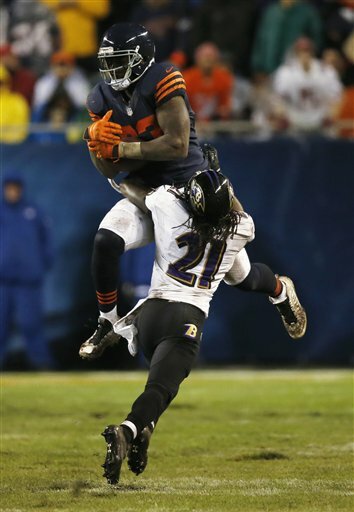 Finally, against the Bears, the Ravens had the Bears in a third and long situation in overtime, but allowed for Josh McCown to complete a crossing route for a first down and three plays later, the Bears kicked a game winning field goal. All close, hard-fought games, that could’ve gone the Ravens way had they gotten the ball back one last time. The defense has typically played great for the first three quarters and that was evident this past Thursday when they took on the Steelers. Then, for some reason, they looked like a completely different group come the fourth quarter. On Thursday, Ben Roethlisberger had all day to throw and he made the Ravens pay. On his touchdown pass to Emmanuel Sanders he had so much time that he was able to find Sanders all alone in the back of the end zone. The pass rush was non existent. It was the first time the Ravens didn’t record a sack in 22 games. It is tough to play great fourth quarter defense when you are unable to get any pressure on the quarterback. This was also the case against the Bengals a few weeks ago when they had a 17-3 lead going into the fourth quarter, but had to win in overtime. It is confusing to see a defense dominate for three quarters of a game and then disappear in the fourth quarter. It appears that the biggest problem lies within the pass rush. The pass rush has been very inconsistent the past few weeks and when they have had their opportunities to make a play, they have often missed the quarterback. The secondary, as well as they have been playing, can’t be expected to cover for more than 4-5 seconds before someone gets open. The pass rush hasn’t been the only issue for this defense in the fourth quarter. They haven’t forced any big turnovers in these big moments. They need playmakers on this defense to make big plays. 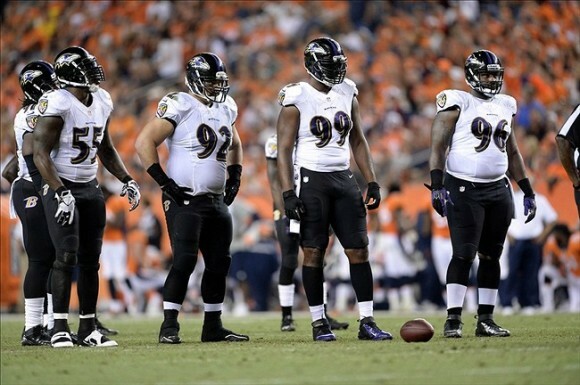 Terrell Suggs or Elivs Dumervil needs to get around the edge and force a fumble. Haloti Ngata should be forcing pressure up the middle and making big hits. Cornerbacks Lardarius Webb, Corey Graham, and Jimmy Smith need to either swat balls away or intercept them in these moments, and safeties James Ihedigbo and Matt Elam need to be able to read the coverage right to break on the ball at the right moment. On top of that, the unit must be able to play strong run defense to force third and long situations. In those close games, the run defense couldn’t stop their opponents from gaining first downs, which not only prolonged drives, but also kept the clock running. The Ravens road ahead isn’t easy at all. After this week’s matchup with the Vikings, their last three games are against teams that currently are leading their respective divisions. 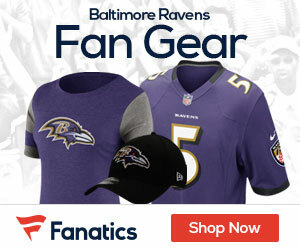 If the Ravens play the way they have the past two weeks they will be able to contend with the Lions, Patriots, and Bengals. If their defense can’t step up in the fourth quarter, however, it is tough to imagine them having a strong finish to their season.